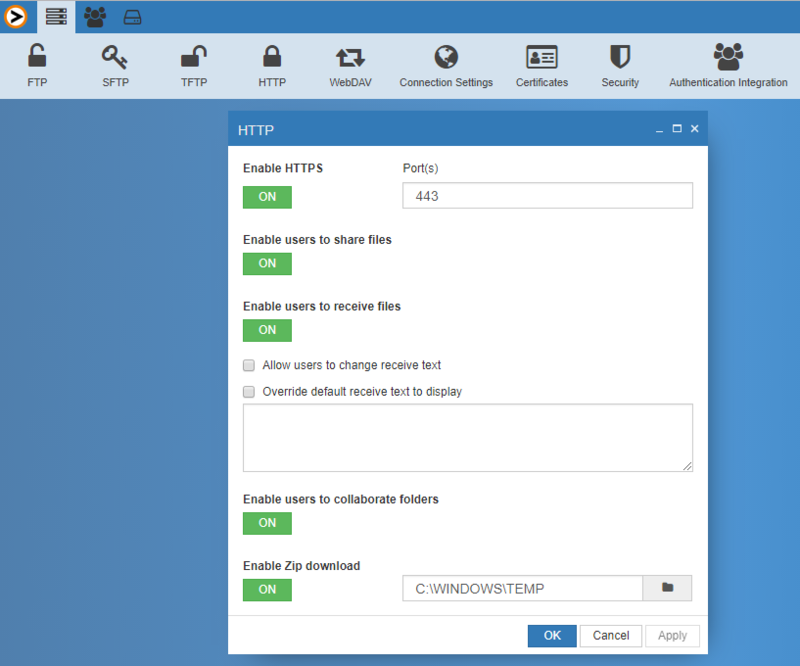 A built in webserver provides easy and secure access over HTTPS. Users can access their account using a browser; no special client software needed. HTTPS uses a browser to transfer files. This provides a very different user experience from traditional FTP. The user will not need any FTP software. You can list, download, upload, delete and rename files using a regular webbrowser. Make your FTP server more accessible to the users. By not requiring any extra software your service becomes more appealing by lowering the threshold. Your service will also reach people when they’re behind a firewall that blocks FTP. The URI scheme lets you link to the specific folder or file that you need. Just enter the address to the server followed by the path to your file and you are sent directly to it. If you are accessing the same resource regularly, you can quickly reach it through a bookmark. HTTPS is an encrypted service, no information is sent in clear text. This means your communication is secure. The HTTPS service is integrated with all the features that come with ProVide. You get the Speed scheduler, Active Directory Integration, Events and much more. To access the HTTP settings you need to login on the web based Admin interface with an account that has Admin privileges then in the top menu you click on “HTTP”.